At C2E2, the Marvel’s True Believers panel was open only to Marvel Mastercard holders and Marvel Unlimited Plus members, but You Don’t Read Comics was there to bring you all of the latest reveals. 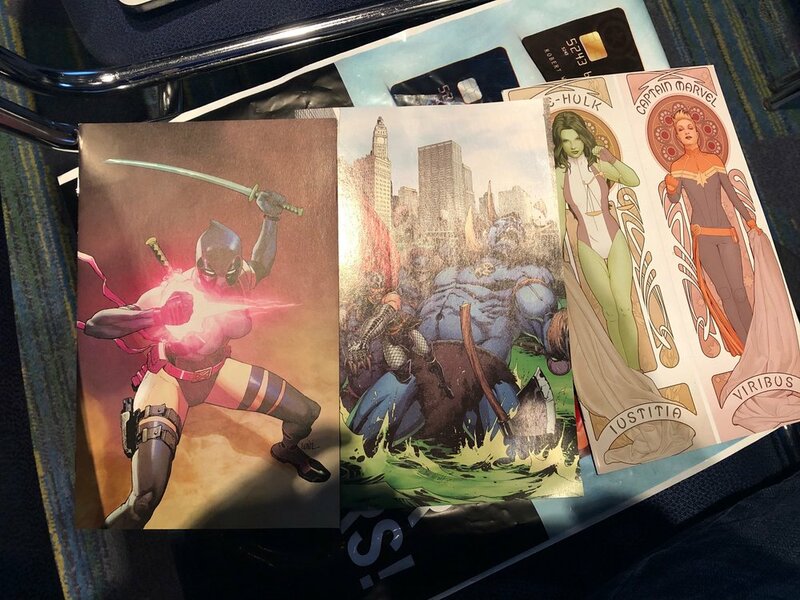 Guests of the panel were given copies of Thor #11, Astonishing X-Men #11, and Avengers #1 with exclusive variant covers. The panel was moderated by Ryan Penagos, and featured Matthew Rosenberg (writer Uncanny X-Men), Tini Howard (writer Thanos, Belit), and Nick Spencer (writer of The Amazing Spider-Man). Nick Spencer discussed the current arc in The Amazing Spider-Man, “Hunted.” Asked how to choose which characters to include, Spencer expressed the challenge--”Wikipedia was a thing.” In April, Marvel will be releasing The Amazing Spider-Man #18.HU by Spencer with art by Ken Lashley, featuring The Gibbon. “It’s a tear-jerker,” Spencer said. “This is kind of the story of his experience in the park. There will be more .HU issues, featuring Black Cat and The Vulture. Next, Matthew Rosenberg discussed his upcoming issue of War of the Realms: X-Men #1, with art by Pere Perez. “The X-Men are going to be dealing with the upcoming crisis of the War of the Realms,” said Rosenberg. Penagos noted that the Distinguished Competition doesn’t own the word “crisis.” “The X-Men have an odd history of dealing with Asgardian stuff,” Rosenberg continued, discussing Dani Moonstar’s time as a Valkyrie and other Mutant/Asgardian entaglements. Rosenberg and Penagos discussed the story’s roots in classic Walter Simonson/Arthur Adams run on Thor. The panel included sneak peeks at some terrific new art. Unfortunately, photos were not allowed. Penagos asked Rosenberg when he decided to put Wolverine and Cyclops in their classic costumes. “Real early,” Rosenberg responded. “We wanted to do a looking back so we could honor the [sixty-something] years of X-Men that we’ve all loved.” He added “There’s a middle point between nostalgia and forging a new path.” He reasoned that since both Scott and Logan are coming back from the dead, they are rediscovering who they are so they are wearing classic costumes rather than the costumes they wore when they died. Rosenberg reasoned that Cyclops has softened, and Wolverine has become harder. “Also they’re real awesome,” Rosenberg added about the classic costumes. Penagos asked the panel who are their favorite animal-themed characters (aside from Spider-Man). Howard chose The Lizard. Rosenberg chose The Vulture; “I like him because he’s the only villain in the Marvel Universe that I’m like, I could take him in a fight.” Nick Spencer chose The Beetle, and referenced his classic run on The Superior Foes of Spider-Man. The panel went on to discuss Uncanny X-Men #16, which comes out in April. Rosenberg discussed the appearance of Dani Moonstar in both Uncanny X-Men and the currently-running alternate universe Age of X-Man event, and revealed that Magneto will also be appearing in both continuities. The issue will also feature the return of Kwana (? ), the assassin who spent years being inhabited by Betsy Braddock aka Psylocke. Penagos asked the panel for their favorite obscure X-Men character. Howard chose Rictor. “I’m also a depressed kid who grew up Catholic, so I relate to Rictor a lot,” said Howard. Rosenberg chose Skids. “In my head I have like this Skids vs Boom Boom rivalry which isn’t really on the page,” said Rosenberg. Spencer chose Emma Frost. Penagos went on to discuss Rosenberg’s run on The Punisher with Szymon Kudranski. “Frank...has decided to hunt Baron Zemo and kill him,” Rosenberg explained. “Frank ended up in prison [in Bagalia]...Frank likes going to prison, because there are plenty of people to murder.” This is a problem because in Bagalia the people in prison are good people, who are missionaries and aid workers, so The Punisher leads a big jailbreak. “The first glimpses of Thanos that we get are through the eyes of other people,” she said. “It’s hard to write Thanos vulnerable, because the audience has to believe it.” The series will also involve Thanos’ infatuation with Death, and Gamora’s involvement with that. “You’ll see the Black Order when they were all assistant managers,” Howard joked. “I’m so intensely proud of this book...it is pure doom metal and the loneliness of space,” she added. Penagos recommends Venom Space Knight for more Ariel Olivetti art. Penagos showed a clip from the season 2 of Marvel’s Cloak & Dagger TV show, exclusive to the panel. The clip began with Cloak practicing basketball while Dagger practiced ballet, set to hip-hop music. Following this was a confrontation between Cloak and Dagger, as Ty apologized to Tandy for something and then asked for her help. Marvel’s Cloak and Dagger premieres in April on Freeform. Penagos shared an exclusive code for 10,000 Marvel Insider points, followed by a Q&A section. Q: In canon, what do your characters keep in their pouches? Rosenberg: Cyclops is the ultimate boy scout. He’s got wet wipes, and a compass, granola bars, toys in case he meets a child, a folding poncho. I wanted to do a whole series about that, here’s Cyclops fixing your plumbing because he’s got a workman tool in there, but they said no. Spencer: Spider-Man doesn’t even have somewhere to put a wallet. Howard: I imagine there’s nothing in those pouches, he just put an empty belt pouch on to close his robe so he can go kill people. Rosenberg: I like to think Thanos’ pouches are just full of ashes. Q: In a world where people in the real world put on body armor and kill people, why does the Punisher still exist? Rosenberg: The Punisher is villain. He’s not a good guy...He’s not an aspirational character...I want his feet planted in the Marvel Universe so that we can see how much the Marvel Universe doesn’t like him. He is a bad guy who hunts bad guys. This is not something we endorse. It’s a study in the same way Friday the 13th is a study of Freddy Kreuger. The Punisher is a man who broke. He’s a cautionary tale. He’s a complicated and difficult question to wrestle with. We don’t want people wanting to be him. He’s not someone that the Armed Forces or anyone should think is great. He’s terrifying.